Directions: From Candelaria between 12th Street and Rio Grande, turn into the Valley High School parking lot. Pool is on the west side of the parking lot. Valley Pool is one of three public pools operated by the City of Albuquerque used in conjunction with Albuquerque Public School events. Valley is available to school students and athletes, as well as the public. Valley Pool underwent renovations in 2007. This pool uses solar power to keep is water warm and save energy costs. Valley also uses UV to help keep the water clean and void of contaminates. 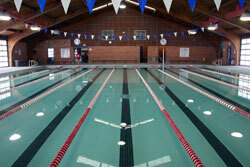 Swimming lessons are offered in the fall, spring, and summer at Valley. Practice is from 4 p.m. to 4:55 p.m., Monday through Friday. Lap Swim Early Bird Lap Swim Monday - Friday 6 a.m. - 8 a.m.
for Everyone Monday - Friday 7 p.m. - 8 p.m.
Monday - Thursday 6:30 p.m - 7:30 p.m.
Saturday - Sunday 12 p.m. - 1 p.m.
for Everyone Monday - Friday 11:30 a.m. - 4 p.m.
Monday - Thursday 7:30 p.m. - 8:30 p.m.
Friday 5 p.m. - 8:30 p.m.
Saturday - Sunday 1p.m. - 5 p.m.